The weather wasn’t the greatest, but needing to get outside we decided on the Park Point Hiking Trail. We had no particular purpose in mind. Rich would be happy to find some birds, and I’d be content with a bit of exercise and fresh air. With strong NE winds blowing off the lake, chilled by the miles of ice crushed up against the sandy beach, we were glad to find that the trail’s trees kept us reasonably sheltered. In fact, as the skies brightened and we warmed with the effort of walking through shifty sand, the afternoon’s prospects improved considerably. Detouring to the bay side, it was positively calm and almost warm. There it was easy to dawdle through the grasses, soak up the sun and listen to the water quietly lapping at the shore. 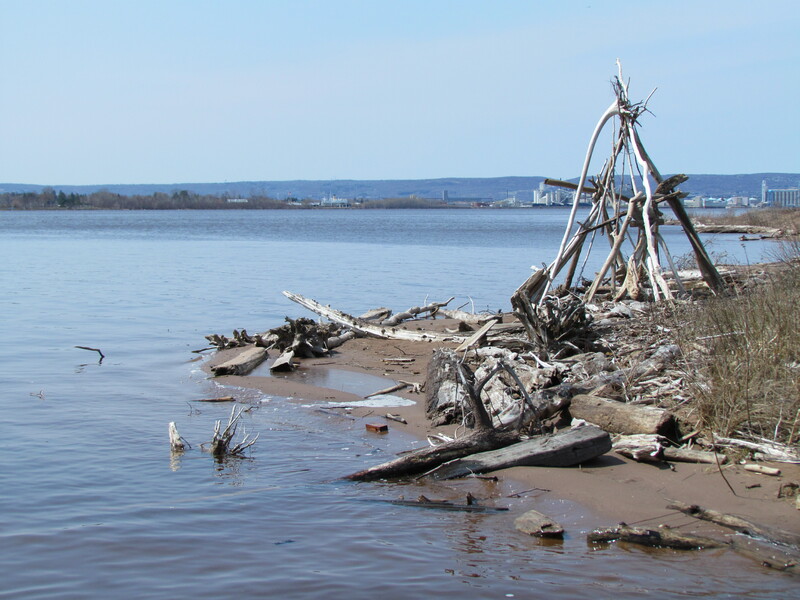 While Rich checked his favorite birding spots, I wandered the shore admiring the driftwood, including the teepee sculpture left by some industrious visitors. Warmed by that interlude, we continued along the trail. Despite the growing patches of snow, and the cold winds that pierced the tree branches, we happily carried on and eventually made our way to the end – the Superior entry. Walking out the narrow catwalk on the outside of the piers was chilling as we met the full force of the wind and were surrounded by ice that clogged most of the entry. But having come that far, it wasn’t an option to stop short of the end of the pier. It was only chance that made Rich look up as we carefully picked our way back to land, and there it was – a boat about to enter the canal. We’d seen it loading at the grain dock across the harbor, and wished it would finish in time to see it leave. It appeared our wish was being granted! 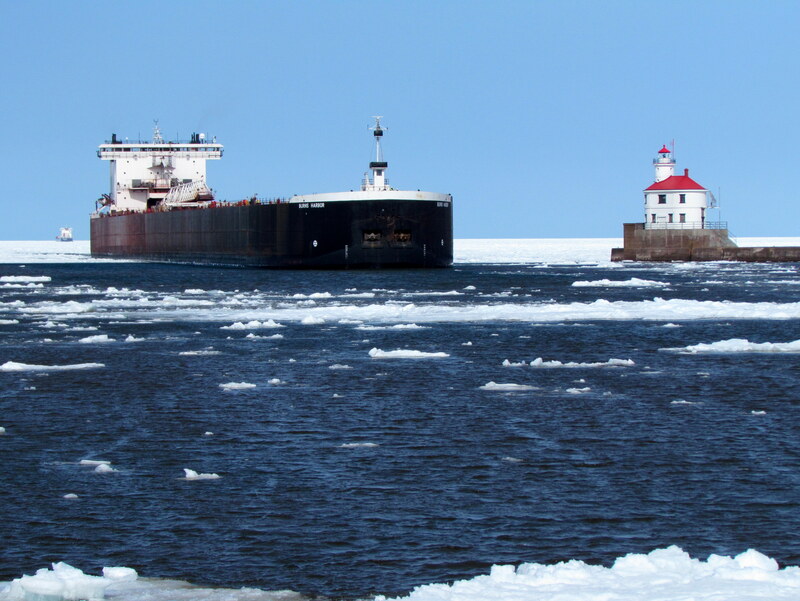 Pushing its way through the floating ice, the Algoma Equinox created currents that propelled other ice flows past our perch back out at the end of the pier. Slowly, gracefully it slid past us as our cameras clicked and whirred. At the same time, we realized this was turning into a double-wish day. Rich had speculated that the boat anchored off shore was waiting for the same grain dock, and sure enough – now it was visibly moving closer. 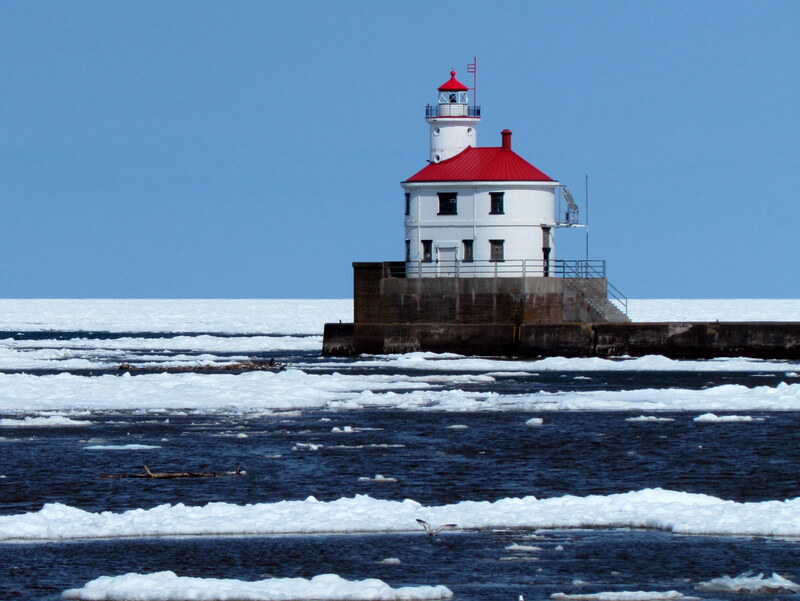 It seemed to be barely inching forward, and it was frigid standing out there in the wind. But we knew we couldn’t leave. Neither of us had ever seen a boat go through the Superior entry before, and now we had the chance to see one go in and one out all in one visit! We alternately huddled behind the cement ramparts and peered over the edge to check on the boat’s progress. By the time it came close enough to put our cameras into action again, we’d been out there nearly an hour. It looked like a twin of the departing ship. But we welcomed the entrance of the Burns Harbor and accompanied it along the length of the pier, nearly keeping pace with its careful movement. Regaining the protection of the hiking trail, we couldn’t help but feel pleased with our adventure. 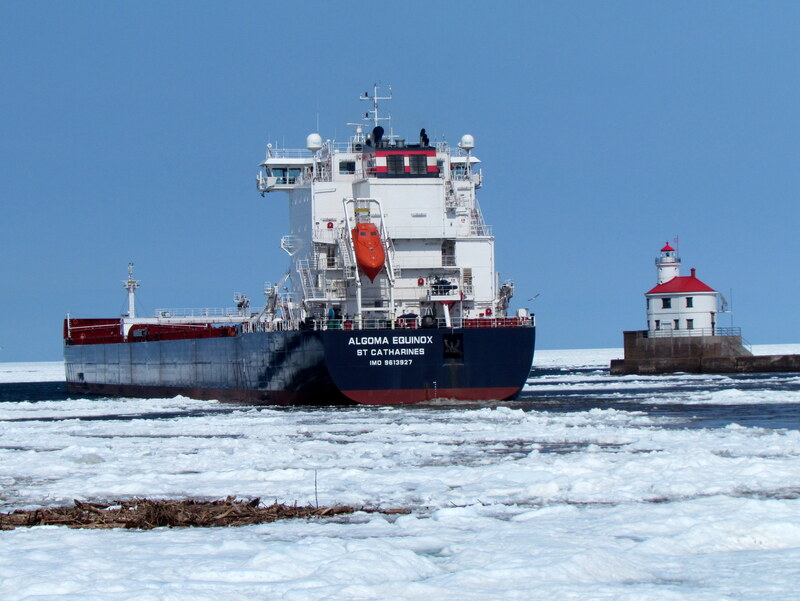 We’d experienced the dichotomy of Park Point weather, ushered two ships through the Superior entry, and found plenty of photographic material. For an afternoon with no expectations, Park Point certainly delivered. 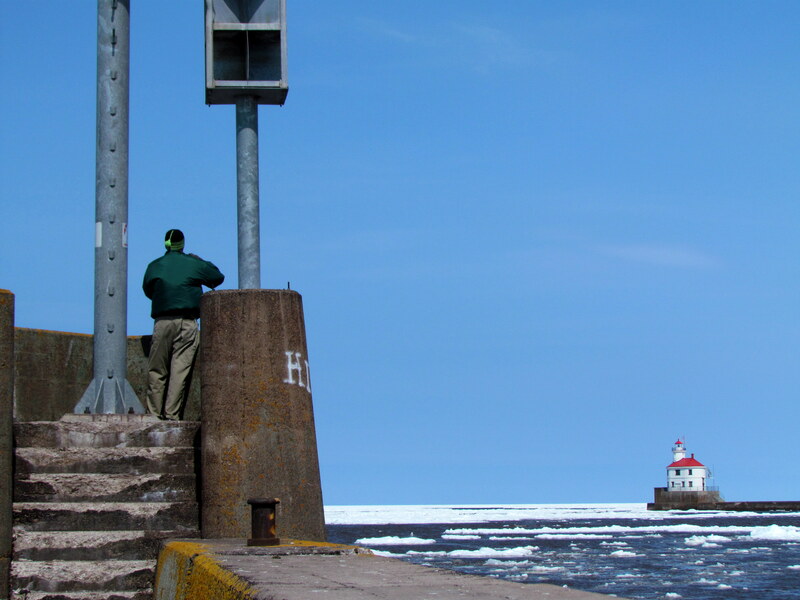 This entry was posted in Outdoors and tagged Duluth Minnesota, Hiking, Lake Superior, Outdoors by Molly. Bookmark the permalink.